Lux is a unit to measure the intensity of light. Indoor lighting might seem bright but is typically below 500 Lux. 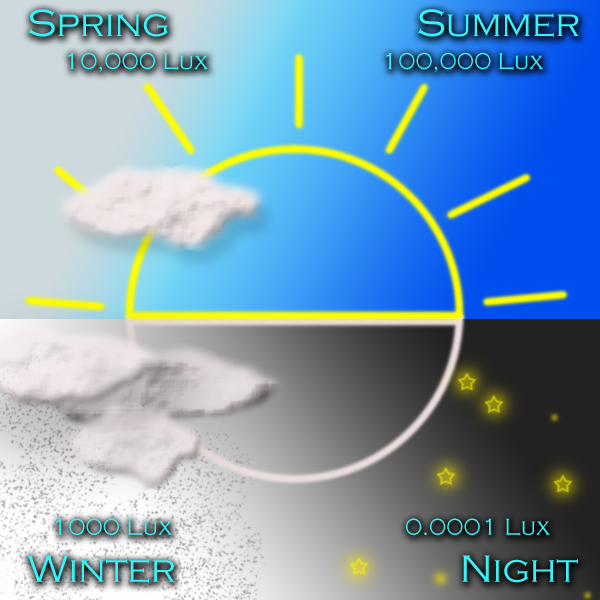 You can get 10,000 Lux outdoors in the summer or spring but in winter it can be difficult! That’s why all Northern Light Technologies bright light products provide 10,000 Lux. Just 30 minutes of 10,000 Lux can help you find the energy you need to thrive. 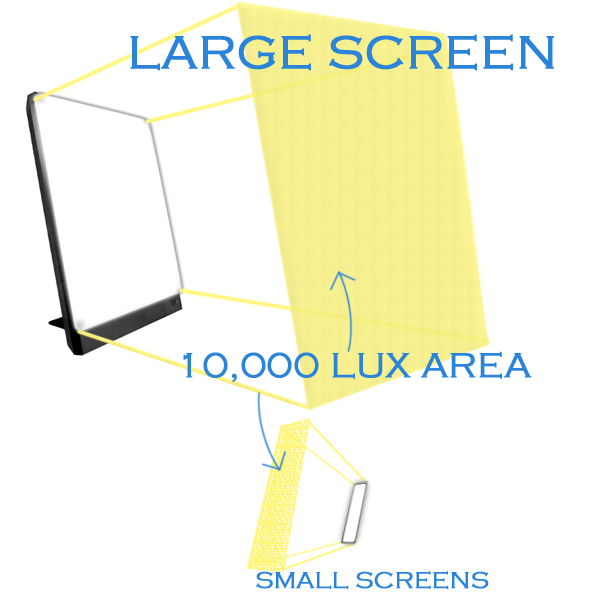 The entire sky is lit up by the sun as your entire face will be lit up by our products large light screens. Our lamps use full spectrum tubes and produce a white light. They mimic the sun in quantity (Lux) and quality (wavelength). To get bright light therapy your eyes must fall in the 10,000 Lux area. This makes getting 10,000 Lux with small units very difficult. Q Do I need to look directly at the light? A No, but the light should shine in your eyes. Q Do I need to have my eyes open? A Yes. Therefore you cannot sleep or meditate. Q Can I wear sunglasses? A No. You cannot wear sunglasses or tinted glasses. Q Can I wear glasses? A Yes. Glasses are okay. Q Is the UV blocked? A Yes. There is a UV filter. Explanation: You should face the light and have it shine in your eyes. It is not necessary to look directly at it, but looking directly at the light won’t do you any harm. Sunglasses block light. If you wear sunglasses you will not be getting 10,000 Lux. Glasses do not block much light. If you wear glasses you will still get 10,000 Lux. You should not wear any apparel such as a visor that will block the light from reaching your eyes. Q Does it matter what time of day I use the light? A Yes, it is preferable in the morning to keep a proper sleep-wake cycle. Q Can I use it all day? A Yes. You can use it as a regular desk lamp. However use at night may keep you awake. Q If I sit further away do I need to use it longer? A Yes. You need an hour of therapy with 5,000 Lux. Explanation: It is recommended to get 10,000 Lux for 20-30 minutes. It is important to use the light at about the same time every day. Also try to spend time outdoors during sunny periods. Eat sensibly, exercise, and try to keep regular sleep-wake hours. Q Does it come with the bulbs? A Yes. Q Where can I get replacement bulbs? A A local hardware store or through Northern Light Technologies. Q Are the tubes very expensive? A Between 40$-52$ for replacements. Q How long will the tubes last? A The tubes will last for 20,000 hours. Explanation: The tubes are rated for 20,000 hours, however their light output declines with usage. To keep the light at its brightest the tubes should be replaced every few years. Q Will it work in other countries? A The SADelite, Flamingo, BOXelite, TRAVelite and SHOWoff will work on 110-270 V and 50-60 Hz. Adaptor may be required. Q Does it run on batteries? A No. Q Does it have a power cord? A Yes. All our power cords are about 8ft long. Q Can the light be dimmed? A No. Tilt or turn away from your eyes to get less light. Q Does it have a timer? A No. Explanation: Each unit has a grounded plug and an ON/OFF switch. They do not dim. They do not have a timer. They do not turn off automatically. They are very efficient and produce no hum, no flicker, low emf and very little heat. Have a different question? Call us at 1-800-263-0066, we’ll be happy to help!